We can help you use mobile technologies to connect with your audiences by making a custom events app for your festival, venue, or locality. 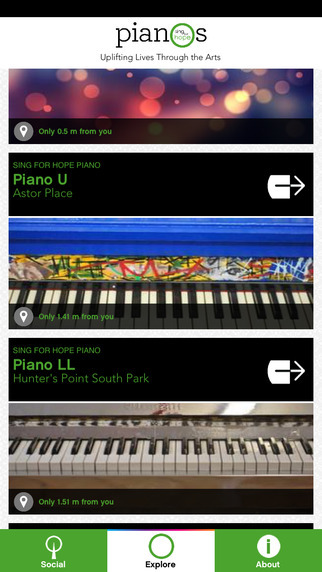 Case Study: We created a custom mobile app for Sing For Hope, a New York City-based arts education organization that created an installation of 50 custom-pained pianos in parks and plazas across the five boroughs in June 2015. The app allowed users to find the nearest piano, take and see pictures of the each piano, find information about the artist who created the piano, donate, and learn more. It was also seamlessly integrated with social media, enabling users to share from the app to their social media accounts.